Hi tea, cake & party lovers! Welcome to the all new POP website! A long time & a lot of cake in the making, the new site is about where we are as a company right now. It's full of our past adventures, ideas of what's to come & all the ways we can help you to make your event idea come to life! For the first post, I'll be running through one of our highlights during our time so far, this month's magical 21st Birthday tea! We've had some wonderful experiences doing what we do, & we love nothing more than making a super fan's dream party a reality. Case in point: Our magical themed afternoon tea party. This 21st party for a select few family and friends took place in Staffordshire in early August, not far from where our business idea was formed! The attention to detail was big on this one, it had to be - the Birthday girl was a wizard fan & we wanted to use the to put our signature quirky twist on proceedings. It all begin with letters (complete with wax seal! - Careful, it burns!) being sent out to the guests in question. Click to see the party for yourself! This video was taken on the day. 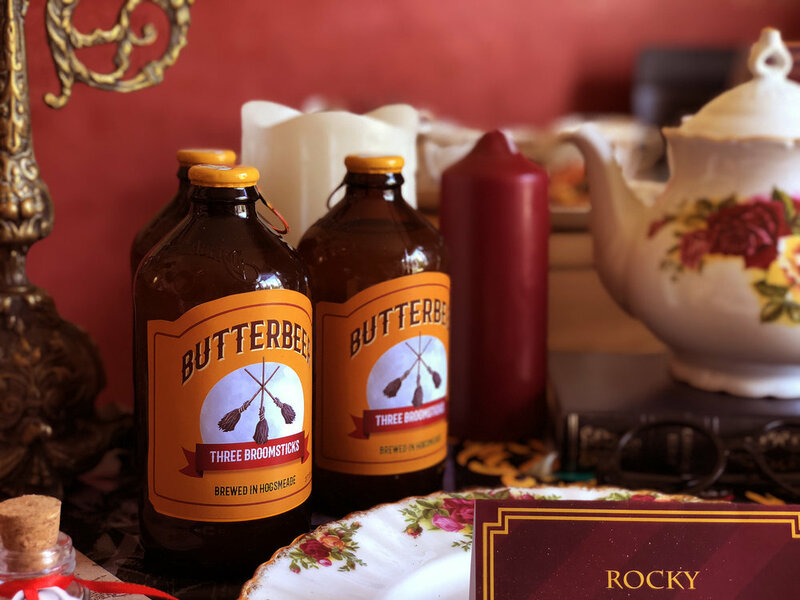 Our magical props & catering worked well with the host's Potter themed decorations! The Menu consisted of a magical twist on our class Afternoon Tea menu. Philosopher's Scones of reddish hues complete with gold glitter replaced our usual options... something we may steer clear of in the future, there was no magic spell to determine the correct colour for this witch! *Note to self - avoid red food colouring unless you want a reminder you used it for a week on your paws. BUTTERBEER! I adore this photo - how cute are these handmade gifts for guests to take away?! Our vintage china was hand picked (as it is with all our events!) to match a Potter-esque theme and again we ran with one main colour scheme. Themed food labels are great if you have guests with food allergies. Divination Class was an idea we had to provide some quirky entertainment to our guests! Guests took it in turns to seek their future with help from a Divination teacher who was under strict instructions not to tell the Birthday Girl if she saw the Grim... *We have an incredibly morbid sense of humour at Pretty Odd HQ. These Sleeping Draught cupcakes were a simple way to add some magic to the menu, they must have been a hit as they had magically disappeared when we returned. Note to students: Not to be taken before Flying Class. These replaced an option on our usual menu, we thought they served as spot-on replicas! SWEETS! Our usual Pick n Mix bags were instead replaced by Sherbert Lemons, sugar wands & chocolate frogs we sprayed with edible glitter. We bought LOTS & had a little party of our own back at the studio. SHAMELESS PLUG ALERT* Did you know you can hire out our Travelling Sweet Shop in Wizard-style, could be perfect for Halloween?! Check out our Travelling Sweet Shop section for more info! FYI: Check out the golden snitches - cute or what?! Some of our usual items were perfect for dressing the space. Our vintage suitcases, books & vintage china lined the tables and helped to create the illusion of a magical Afternoon Tea. We also personalised several disposable items such as name cards and included nods within menu names to guests at the party. LOVE an excuse to bring out the fully functional colour changing working cauldron. As you do. Personalised graphics were created especially for the party. Themed activities are perfect to help immerse your guests into the world you're trying to create! I've never been to another party with tea leaf reading, have you?! We'd love to hear about some of the funniest/strangest party games you've played! (we think!). Our menu was a hit, we had allergies to cater for, but managed to put a magical spin on proceedings. Classic crustless Afternoon Tea sandwiches, scones with jam & cream, an array of puddings and a variety of quirky drinks including those within our Pumpkin & Death Eater-esque skull dispensers! So that's our magical themed 21st Party! Thank you so much for stopping by, we hope you enjoyed it! What would be your Dream Theme? We'd love to hear from you!